52 Tuesdays follows the parallel tales of James (Del Herbert-Jane), a transgender man embarking on his transition, and Billie (Tilda Cobham-Hervey), James’ 16-year-old daughter who is struggling with her own burgeoning sexuality. James, unable to cope with raising a teenage girl and managing a transition at the same time, sends Billie off to stay with her father, Tom (Beau Travis Williams). To soothe an upset Billie, James offers a weekly four-hour visit, promising that ‘no matter what’ the two will meet every week and spend time together. Set and filmed in Adelaide, the film takes on a fragmentary quality as it chronicles the pair’s ups and downs in weekly instalments. Feeling rejected by her mother, Billie initiates a polyamorous relationship with Jasmine (Imogen Archer) and Josh (Sam Althuizen), two older students from her high school. She is forced to confide in her uncle Harry (Mario Späte) about her otherwise secret trysts with the couple. 52 Tuesdays is less about James’ transition than it is about Billie’s. Billie’s narrative arc is thematically concerned with the struggle for adequate self-expression; the film reflects on the limited nature of language and our strong desire to articulate an identity, through art, through actions, through labels. Billie frequently addresses the camera – and, seemingly, the audience – in video diary entries (something James also does in order to create a record of his transition) – and she repeats this line dozens of times: ‘There are so many things I should have told you before now. So many things I should have said – ‘ At this point, she breaks off, unable to put into words what has happened to her and the changes she has undergone in the space of a single year. To say that the film focuses on Billie is not to say that the film does not examine the difficulties faced by trans* men and women in Australian society. Throughout the course of the film, James struggles to leave the house, declaring himself ‘not ready’ and forever saying ‘not yet.’ Characters like James’ ex-husband Tom, whom “Jane” left when Billie was only one year old, talk about James’ lack of confidence – they describe him as pathologically hesitant, always waiting, always putting off coming out or undergoing surgery because of his fear. James struggles – as most of us do – with defining his own identity against others’ ideas of him. It’s worth noting – in a film preoccupied with the language and personal explanation – the various ways in which the other characters talk about James. It is an instance of high-realism for the otherwise stagey film: characters slip between male and female pronouns, sometimes unintentionally, sometimes as a way of challenging James for his choices, or even rejecting the idea that “James” can ever stop being “Jane.” Billie in particular struggles with the idea of losing her mother as James transitions; early on she teases James, saying ‘Should I call you Dad? Pop? Pappa?’ The two come to no conclusion, at least not on screen, but by the end of the film Billie refers to James as her mother, while still using masculine pronouns. In the context of the film, this comes across as an acknowledgement of the tension between James’ desired identity and his existing relationship with Billie. It is also worth noting the self-consciousness with which filmmaker Sophie Hyde explores her subject matter. (52 Tuesdays is her directorial debut; she also co-wrote the screenplay.) The film was shot over the course of a year, and only on Tuesdays; the crew allowed themselves to film up until midnight, and never missed a Tuesday, much like James and Billie. The cast, almost entirely made up of non-professional actors, received their scripts in similarly divided segments, and were only given parts pertaining to their characters. This artificial structure, orchestrated by Hyde and fellow screenwriter Matthew Cormack, perhaps explains the stilted nature of the final product. Tilda Cobham-Hervey, who played Billie, seems to suffer from the lack of flow more than her fellow actors; although her performance is a shade stiff and unnatural in the early scenes, she relaxes into her character by the film’s conclusion. Del Herbert-Jane’s performance as James is the strongest – which made it all the more surprising to discover that Del became involved in the 52 Tuesdays project as a consultant on gender diversity before being asked to join the cast, and that Del does not consider themself a professional actor. Post-filming, Del has returned to working in their chosen career field – challenging the binary system of gender expression. While an awesome goal, this is something of a loss for Australian cinema, considering their mesmerising and forceful screen presence in 52 Tuesdays. 52 Tuesdays has a simple tagline: ‘One day a week, every week for a year.’ It’s straightforward, descriptive without any embellishment; an explanatory footnote. The film itself, however, wastes no time plunging into complicated, emotionally fraught material. 52 Tuesdays is clever, intriguing, and rough – rough on the audience members that empathise with Billie, forced to follow her through her messy, painful coming-of-age. I’m super excited to watch this movie! I love anything that explores our conceptions of gender. 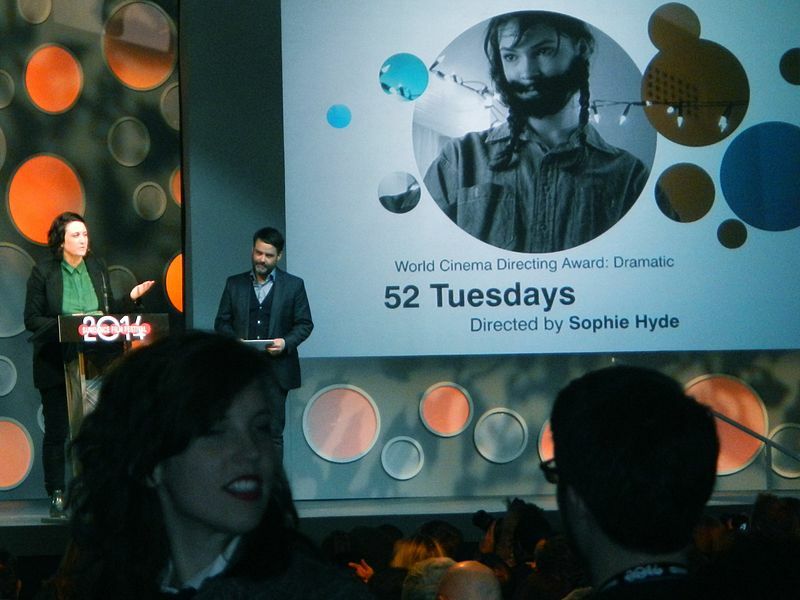 Also, am very proud that 52 Tuesdays champions a female director and is an Adelaide production. This entry was posted in Film and tagged film. Bookmark the permalink.